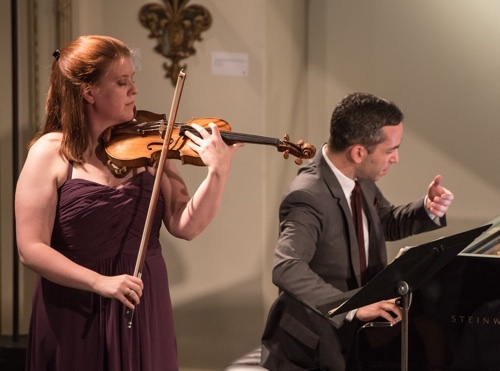 A classy phenomenon held for three weeks on the peninsula, Music@Menlo is devoting this year’s summer festival to the short and prolific life of Franz Schubert. Their fifth main concert program, titled “The Setting Sun,” perused chamber works from the last two years of his life including the powerful Trio No. 2 in E-flat Major for piano, violin and cello. Friday’s concert, on July 31, was an opportunity to hear his natural exuberance tempered by ill health and the foreknowledge of his mortality. Thirteen years into this very popular festival (many of the concerts are sold out), Artistic Directors Wu Han and David Finckel continue to be welcoming faces and advocates of education, and introduce some of the finest musicians of our time. So it is sometimes easy to forget their own musicianship. In Schubert’s Trio No. 2 Finckel pulled fat resonance from the bottom of his cello and ease and agility from the top, while Han delivered nuance and power on the piano, pouring out dizzying trickles and runs that could sparkle or rumble. But before that richness, we were treated to reverie and more than a bit of splash. Pianist Inon Barnaton took the stage playing two impromptus back to back. In the Impromptu in F Minor he showed off great phrasing, an ability to layer meaning into each hesitation, and a sense of weight that ran the gamut from tentative to bruising. Barnaton delivered this gem of German romanticism with a tension that drew substance into each note and a fluidity that made it feel weightless. After rising motifs and pensive responses and sweet melancholy and watery murmurings, we heard the Impromptu in G-flat Major. This one was taken at a grave walk, and it seemed as if Schubert were still walking beside Beethoven’s coffin. Here were quiet bass arpeggios and high figures that alternated between reflective and despairing, a deeply present moment like a held breath. While Schubert’s orchestral works showed a growing maturity in colorations and sophisticated harmonies, he is called the King of Lieder for his exquisite song-cycles. Demonstrating that, we next heard Nikolay Borchev in Sei mir gegrüsst, a delicate song for baritone and piano. Borchev was well chosen to show off the power of this simple melody with a voice of huge upper depth, open, vulnerable and supple. Schubert reused that theme in his Fantasy in C Major for Violin and Piano, a work abounding in silken statements and rephrasing, echoes and variations. Here Barnaton paired with Erin Keefe, the concertmaster of the Minnesota Orchestra and a regular at Music@Menlo. After the frailty of the opening, they took a turn for playful and fiery runs. In the third movement violin and piano dived into the Sei mir gegrüsst theme, first with slow majesty and then in variations that grew more and more complex. And turning song into instrumental became the theme of the evening as Borchev introduced another melody, Se solen sjunker by Isak Berg. This was the piece that Schubert reinvented in his Trio No. 2 in E-flat Major, and that Wu Han and David Finckel delivered so passionately. Philip Setzer took the violin part, a rock steady partner for cello and piano. After the florid opening, they settled into lush statements from the strings and long bright trickles from the piano. The slow Andante, framed as a march, was a brilliant rephrasing of the vocal melody. This is a work that is admired for its orchestral sweep and staying power – it clocks in at 45 minutes – and was delivered tightly and with unflagging energy. 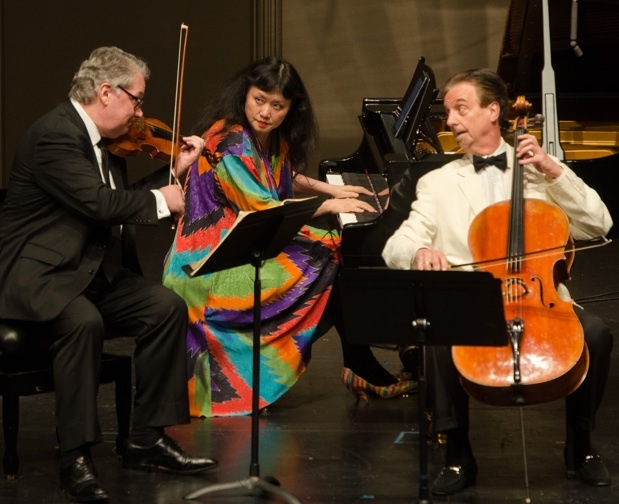 For those who now miss this Festival, which ended Saturday, August 8, Music@Menlo furnishes eight polished lectures, or “Audio Notes,” which can be listened to directly or downloaded from their website, along with a dozen live streamed videos of master classes. See musicatmenlo.org for those and for information on their upcoming winter series. Photo top of Inon Barnatan and Erin Keefe; below, of Wu Han, David Finckel and Philip Setzer; both photos by Carlin Ma.